Vanessa Baird writes about how the Global South is affected by trade and old patterns of power. Olivier Adopo is a rubber tapper in the Grand Lahou forest in the West African country of Côte D’Ivoire. His skill is passed on through generations. It gives him and his community a living. He sells the latex he collects to a local factory. But these are worrying times. The price for latex has fallen by half. The cause? The trade war between China and the US. China is the biggest manufacturer of goods containing rubber in the world, and a fifth of its exports go to the US. The old African saying ‘When elephants fight, it’s the grass that suffers’ has a new meaning in Côte D’Ivoire today. Supporters of free-trade often say that to develop, the countries of the South must be a bigger part of the global trading system. But they are already a big part. Africa is more dependent on overseas trade than Europe or North America. And not in a good way. To get its free-trade EPAs with Africa, the EU threatened sanctions on those countries that did not sign. At the moment (February 2019), Kenya, Rwanda, and Burundi have signed while Uganda is not sure and Nigeria and Tanzania have said no. Up to three-quarters of Africa’s population depends on agriculture for a living. A foolish or quick step towards liberalization can risk the livelihood of these people. Most of them are poor. The EU and US have talked about free trade but not practised it themselves and paid their own farmers big subsidies. But today China, not Europe, is the biggest player in Africa. China was welcome as a trading partner at first but things are more difficult now. The Chinese bring in their own workers and not local Africans. Their big projects give work to Chinese companies but African nations are in debt. And so China is doing what big powers usually do, it is acting in its own self-interest. Brazilian farmer Gustavo Lopes is happy. In 2017 he decided not to grow his sugar cane and he planted soy on his 4,000-hectare farm. He did the right thing. A couple of months ago, Chinese buyers bought South American soy after Beijing put tariffs on US beans. Lopes got a good price for his soy. Brazil’s new government with far-right leader Jair Bolsonaro is likely to continue the policies of Michel Temer’s government. Temer’s policies helped big farmers and not the indigenous people. In Argentina too, soy farmers are looking to make money from the US-China trade war. Luciana Ghiotto is a researcher and activist. She says that in the past, US companies and investment were the most important in Latin America. But in the last eight years China has taken that place. In January 2018 in a meeting between Latin American presidents and China’s leaders, China offered millions in investment to include Latin America in the ‘New Silk Road’. China gets Latin America’s raw materials – minerals, lithium, gold, magnesium, copper, oil, gas, soy, and so on. Latin America’s neoliberal governments might prefer, ideologically, to do business with the US, but China is their best customer now. Sometimes this leads to weaker relations between Latin American countries. Individual countries are rushing to sign contracts with China that are not open to public scrutiny. ‘They are worse in a way,’ says Ghiotto. China exports capital. Ecuador, Venezuela, and Argentina have received Chinese loans with high interest rates, especially for Venezuela, when commodity prices go down. And China builds. For example, in Argentina China is rebuilding a 1,500 kilometre old railway line, not for people but for soy. 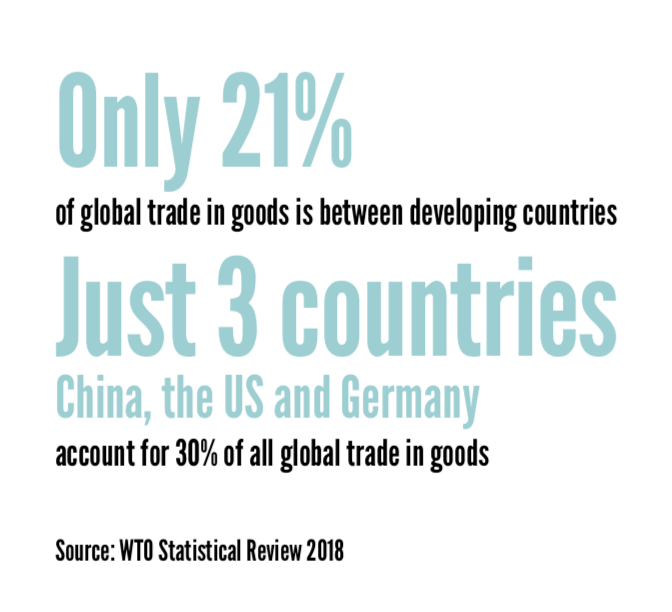 One answer to the problems in global trade is to make efforts again for intra-continental trade, including two South American trade blocs, Mercosur and the Pacific Alliance, working together. But Ghiotto says that these two blocs do not care about human and environmental rights. Today Subramaniam and others are fighting against a free-trade agreement, that they say will destroy the country’s dairy farming, ruin millions of livelihoods, make medicines too expensive, and seriously damage Indian manufacturing. The deal is the Regional Comprehensive Economic Partnership (RCEP) supported by China, which involves the 10 Associations of Southeast Asian Nations (ASEAN) countries – including Indonesia, the Philippines, Malaysia, Brunei, Vietnam, and Cambodia – and six other nations – Australia, New Zealand/Aotearoa, Japan, South Korea, China, and India. If it succeeds, RCEP will be the world’s largest trading bloc, with 3.4 billion people. Talks are planned to finish in 2019. At the time of writing (February 2019) China is still trying to get at least 86-per-cent tariff-free access to the Indian market, but India wants less. India has a big population that depends on domestic agriculture. Subramaniam says, ‘Of the several million small dairy farmers producing milk, 95 per cent are women. This is production by the people, not by a few big corporations. Women spend most of the money from dairy on their families.’ Subramaniam’s own education was thanks to his hardworking mother, who had buffaloes and cows for a living. India has enough milk, with many farmers, co-operatives, local companies, and individual milk sellers. 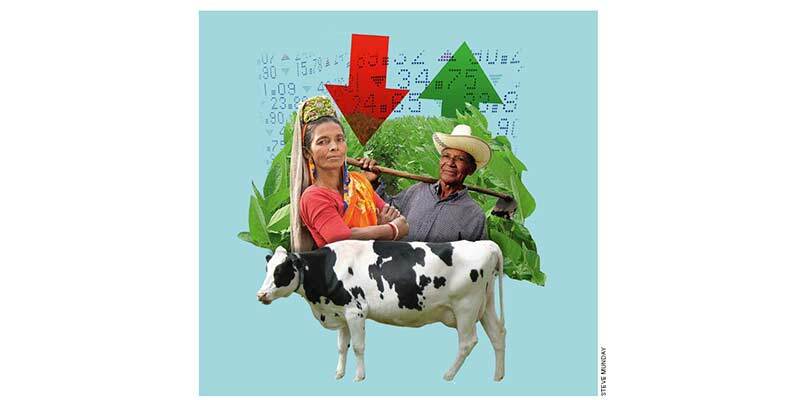 ‘But RCEP will probably destroy the small dairy farmers,’ Subramaniam says. ‘I’m talking about our fears when we think of our country’s experience with edible oil and pulses.’ Twenty years ago, India started importing edible oil. About 70 per cent is now imported and local farmers are forced out of production. The Indian protests against RCEP are growing and are also coming from businesses and those fighting for affordable medicine. Indonesia has a problem. It has two big exports that are difficult for the environment, palm oil and coal. Palm oil is an industry run by large corporations that violates human, environmental, and wildlife rights. The campaign against palm oil is growing in the West and so the Indonesian government is looking for new markets. ‘We have said for a very long time that at the reason for all of this is the unequal impact of globalization. Some countries win more than others, and the countries that are less successful suffer.’ At the end of 2018 we saw the fight between the big trade countries, China and the US, have an effect on the meeting of the Asia-Pacific Economic Cooperation nations (APEC) in Papua New Guinea. As a result, for the first time since it started in 1989, APEC could not agree at the end of the meeting. This page was last edited on 10 February 2019, at 17:21.